Greater Manchester Chamber Blog: Member Blog: Does telemarketing work? Member Blog: Does telemarketing work? Just how effective is telemarketing for B2B services these days? There is no question that the telephone is a valuable and effective business communication tool but it’s the WAY it gets used for much B2B telemarketing that made me stop and think. All too often calls are simply focused on nailing the lead rather than engaging with the prospect – a process through which, if the interest is there, they’ll probably get the lead anyway! So she was engineering a situation to justify her call! She went on talking ‘at’ me (I’m paraphrasing a bit)…. Now call me old fashioned but I don’t just pick an accountant on price. I suggest that professionalism, competence and value for money (as opposed to cost) are more important considerations, but there you go! What’s more, changing accountant is not something that businesses do regularly. A good relationship with your accountant is a valuable element of a successful business. We were looking to change our accountant! We should have been a lead; but the whole approach the telemarketer took just turned me cold. Even though her basic massage was promoting the idea of ‘Cloud-based’ accounting, she wasn’t interested in me, she was interested in getting a lead – which she didn’t. If she’d shown more interest in me and my business needs, and talked with me rather than at me (with some half-baked reason for calling in the first place! ), maybe she would have got somewhere. These days, marketing is so much more about engagement than it is about selling. Since the rise of the internet, if we want to buy something (whether it is a TV or a new accountant) we can go online and research options and find where to buy. Marketing is about influencing our preference. Where and why a customer would like to buy something, and making it easy for those customers/clients to choose us! Cold calling is a leap into the unknown. 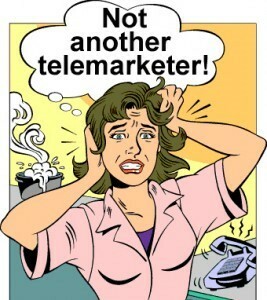 Anyone making a telemarketing call has no idea of the circumstances for the people they are calling. They might be busy, sad, happy, annoyed, who knows? It’s pure port-luck. A good telemarketer can deal with what they find but the ONLY practical way is to empathise and engage. There is another way – and that is to bully. We hear of a lot of this going on in B2C telemarketing and telesales but I believe this approach should have no place, anywhere. So, back to my call. If the telemarketer had talked with me rather than at me, maybe she would’ve got further.  Are you interested in considering an alternative accountant?  Have you considered the benefits of cloud-based accounting?  Do you ever feel you are paying too much for your accountancy services? A positive answer to any of these may have opened the door but just telling me why I should be talking to her didn’t cut it! …and this leads to the opportunity for ongoing communication and engagement, the essence of modern marketing. In my example, the answer is clearly NO!, but I believe if telemarketing embraces engagement as part of a joined-up marketing communication process, it can still play a valuable role in B2B marketing that delivers benefit to everyone. If you are thinking about using telemarketing in your business, I’d be happy to talk to you but, in any event, always remember to think about the opportunity beyond the sales lead.